Ymaging received funding and support from the EU project EU-PLF to develop a prototype pig weight measurement system (PigWei). Coached by experienced entrepreneurs from the project, Ymaging was able to develop a fully functional prototype. A new commercial version is now available. The accuracy of the PigWei system is very high and reaches 1 kg (standard deviation). Measurement data is uploaded for calculation using a complex model. The resulting weight is then retransmitted to the sensor just in a few seconds as long as WiFi with access to the internet is available. A pay per use contract is available. So far the response from the market is tremendous. Production volumes are high in order to fulfil the actual market demands. The Spanish high quality Iberico pigs form an important market for Ymaging. 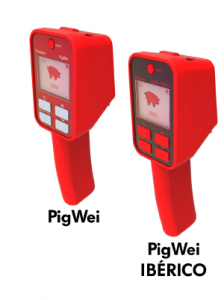 Distributors are selected right now for sales and support of the PigWei System all over Europe and the rest of the world.